*** BE FIRST TO VIEW WITH HUMBERSTONES HOMES NOW & BEAT THE RUSH!! ** WELL PRESENTED semi detached in POPULAR NEIGHBOURHOOD, with DRIVE and GARAGE, and offering SPACIOUS 27ft through lounge/dining area, 11ft kitchen, 3 BEDS, RE-FITTED bathroom, PLEASANT LARGE rear garden. MUST BE VIEWED. EPC rating D.
This is a well presented, spacious 3 bedroomed semi detached home occupying a pleasant position within this popular neighbourhood, set back behind a drive providing off road parking and briefly comprising :- On the ground floor is a porch, entrance hall, spacious through lounge with dining area, kitchen, side vestibule and downstairs wc. 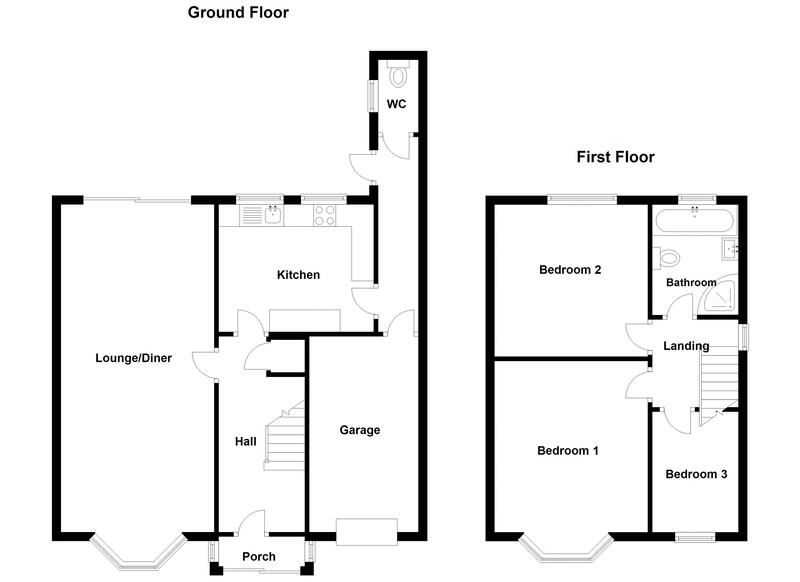 First floor provides 3 bedrooms and re-fitted bathroom with shower cubicle. Outside is a garage and pleasant large rear garden. dg & gch. VIEWING ESSENTIAL. EPC rating D.
Radiator, feature fireplace with hearth housing inset coal effect fire, double glazed sliding patio door onto the rear garden. Double glazed bay window to the front, radiator and laminated style floor. Double glazed window to the side, wc and complimentary tiling to the walls. Double glazed window to the side, loft access and doors off to all First Floor Accommodation. Double glazed bay window to the front, radiator, fitted wardrobes with hanging rail, drawers and storage. Double glazed window to the rear, radiator, and fitted wardrobe with hanging rail and storage. Ceiling spot lights, double glazed window to the rear, heated towel rail, and attractive suite comprising :- Bath, wash handbasin, wc, and shower cubicle with screened door, shower fitment and tiling to the walls. Drive providing off road parking and leading to the accommodation. Up and over door and central heating boiler. Pleasant, large rear garden comprising :- Patio, lawn area, pathway, shrub border, and further garden area beyond.